The theme for the 14th edition of the Smile for the Camera Carnival is: Wedding Belles. Historically, couples married in the month of June to honor Juno, the Roman goddess of marriage. Others did it to time conception so births wouldn't interfere with harvest work. And brides in the 15th century chose to marry in June because it coincided with their "annual bath" - that's right - ensuring a relatively sweet-smelling honeymoon. Show us a photograph of a wedding, a wedding party, a bride, a groom, the reception, or even the honeymoon. 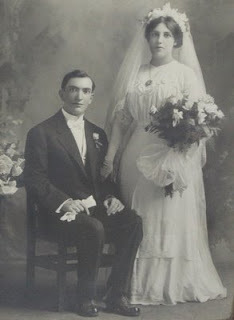 I haven't yet obtained the marriage certificate, but the date of the wedding is written on the back of the photo, and their son Mandell wrote August 27th down as their anniversary in his war diary. I haven't found their marriage in either St. Louis City or St. Louis County records; It is likely they were married in East St. Louis, Illinois, where the Cruvants were living at the time. 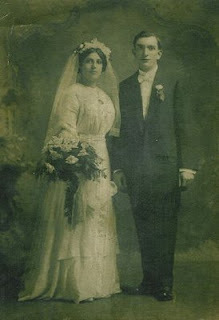 The date is significant in that it means that Bertha's 'gift' to Barney on their first wedding anniversary was my grandfather, Melvin Newmark, who was born on August 27, 1912. What a wonderful gift for an anniversary! The couple looks excited and a little timid at the same time. I like the fact I can see his wedding ring so clearly. Thanks for sharing this with us.